Do you know what my mistake was when our family decided to buy our first cage back in the day? Although I knew that the minimum living space for cavies is 7.5 square feet plus 1.5 feet for every additional guinea pig cage and I did pass that info to my wife, they came home with a pretty looking cage of less than 5 square feet. So I asked: “And where’s the canary?” Nobody laughed. I went online and bought a solid 10 square feet of actual living space for our three cavies. Lesson learned. 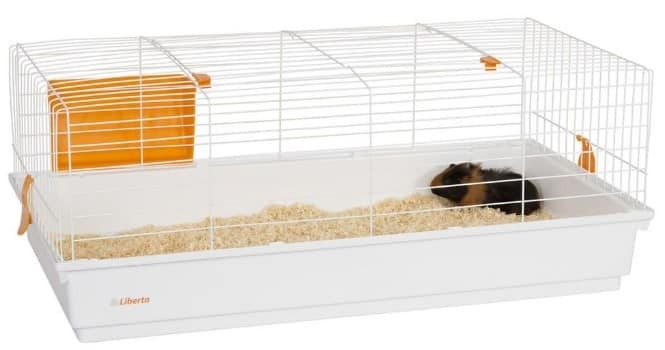 The best best guinea pig cage for your buck is a one-off investment for the good health, long life, and happiness of the furry little companions we all adore, so choose wisely and with love. Please follow the guidelines and get a large cage for your pet cavy. The minimum cage size refers to uninterrupted running space. This means that space is not partitioned by a divider which your pets need to climb or walk over. All 13 recognized guinea pig breeds thrive in homes that allow them ample room to play. 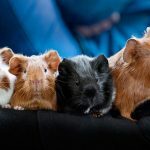 Guinea pigs in large cages also tend to be less depressed and will be more likely to grow up talkative, playful and outgoing because they will feel happy and healthy with enough room to play. Another thing, the local pet store sold us a cage with a wired floor. The explanation that they gave my daughter that it would be easier to clean the poop which falls through the wiring and into the plastic pan. This is a huge NO! Cavies have small and sensitive feet and they need a solid surface. Having their feet constantly pressed against wire may cause a painful condition called “bumblefoot”. Your guinea pig's feet might swell and become infected. To prevent this condition, you should look for a cage that has only solid surfaces where your guinea pig will be running and playing. Compared to the rest of the guinea pig, your cavy’s legs and feet are really too small to be carrying all of the weight so the appropriate solid surfaces will keep them safe, healthy and comfortable. 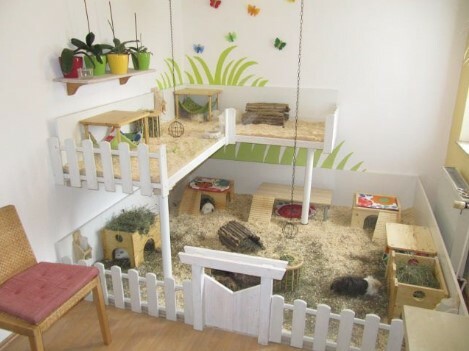 Labyrinth-like cages with ramps and platforms look interesting to the kids and parents but think of your pet first. Ideally, the cage should not have too many areas where a section is connected to another section of the cage by a narrow path or a ramp to an additional level. These will take up a significant amount of room and prevent the guinea pigs from having a wide-open race track to run in. 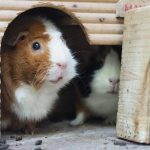 A dominant guinea pig in a larger group will block off access to parts of the cage by taking over a certain section and keeping the other guinea pigs from roaming and playing freely. 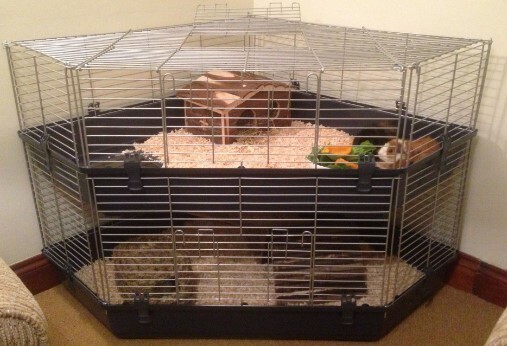 Once a common way to house guinea pigs, aquariums are in fact quite inappropriate habitats for a number of reasons. Firstly, they have solid sides and your pet won't get enough air circulation. Standard aquariums are also way too small for a guinea pig, let alone for a few of them. Cavies are social animals and they do best when you keep two or more together. This makes aquariums worse for the cavies as they might fight if their quarters are too small. Another problem is the fact that the solid glass muffles the sound in the aquarium. A guinea pig that gets used to a closed space will be afraid of you taking them out and exposing them to open space with unmuffled noise. The sides of the aquarium may impair their hearing and vision as well. Well, they are certainly interesting, especially when they include all the accessories such as the food and water containers. Do bear in mind that unlike other species of rodents, cavies don't climb. They need special consideration when vertical space is provided in their cage. With a heavy body compared to tiny legs, you need to consider any heights that your guinea pig can fall from. Guinea pigs can seriously injure themselves in a fall from as little as one foot high. This is why all additional levels should ideally have walls that function like guard rails to keep your guinea pigs from falling over. The ramps between the levels should also have walls to help keep the guinea pigs safely on solid ground when they run between levels. The ramps should be as long as possible to keep the incline level to a minimum and preferably with texture or ridges on a solid surface to prevent sliding down or falling over. This is a very important feature in a good cage: if it comes with a removable top, you will have no problems getting your hands into the cage to pick up your pets, serve food, add accessories or clean the cage. As for the cage trays, they vary in depth from about 3" to 6" deep. 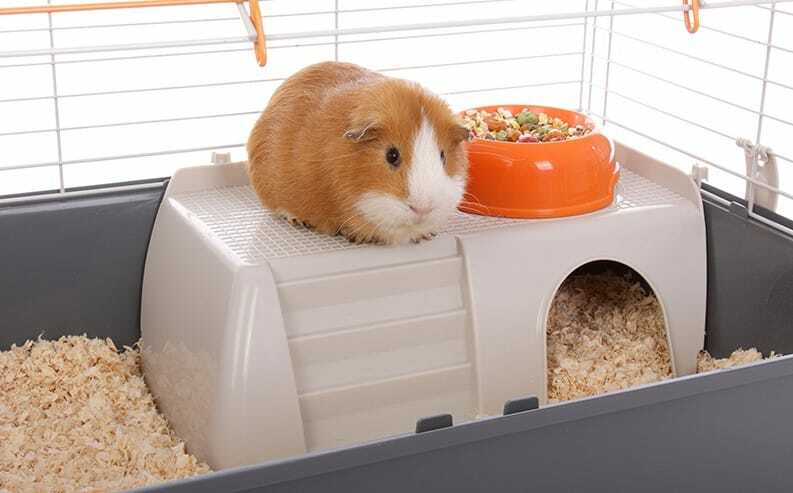 Go for deeper trays as they will prevent the mess around the cage: your guinea pigs will kick some of the bedding out of the cage and onto your carpets and deeper trays or pans around the cage will certainly help. To sum up, size is the most important feature to consider for the wellbeing of your cavies. Pets in larger cages are more likely to exercise on their own. This will increase their lifespan and lower the risk of obesity or muscular related health issues. 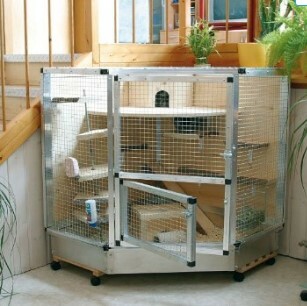 A good-sized cage will not get dirty as quickly and there will be less of an ammonia build up. This will keep your guinea pigs healthier. Guinea pigs which live in social groups are likely to get along with their cagemates if they are provided with enough space to interact. Avoid aquariums, if possible, and if you choose a multi-level cage, check that they are safe for the piggies in terms of possible falls and injuries. Look for cages which have good access for you to handle the piggies and maintain their home full of hay, water, and accessories to play. Avoid small starter cages as that would be not just a waste of money for you, but also a huge mistake in providing inappropriate, unsafe and unhealthy habitat for your loving piggies.